This is my favorite time of year...well one of them! Spring is here and while some can bring out the flipflops, early mornings and evenings still get a bit on the chilly side and what's better than a pair of flip flops paired with a beanie! I think it's a west coast thing as we have the sun shining bright already and we'll honestly wear flip flops anytime of year! With the extra warmth that comes along with beanies, the static can leave a mess at the end of the day. Not to mention the high risk of lice as they find beanies to be the perfect warm place to live. Save yourself the headache at the end of the day dealing with knotted hair and the worry of what else might be nestled up in those knots. 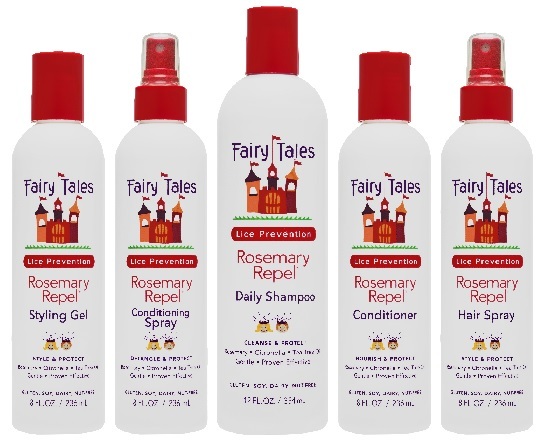 Fairy Tales Hair Care is the perfect solution. My daughter has hair that tangles very easy! She has been using this for a couple weeks and she loves it. I even tried it on my colored hair as it is free of chemicals, toxins, parabens and sulfates. It leaves my hair so smooth and tangle free, not to mention the amazing rosemary smell! Fairy Tales founder Risa Barash has put together a hair tutorial and pro-tips for tackling these very worries - including easy detangling and lice repelling products. Step 1: Prepare For Hair Greatness – Before she gears up for the day, wash with Rosemary Repel Shampoo and then follow with Rosemary Repel Crème Conditioner to start with a smooth foundation and get that extra boost of protection. Hair will actually be easier to style after it has been brushed and is still slightly damp. Step 2: Braid Away – Part hair down the middle, separating hair into two sections. Ensure everything is going to stay in place under that beanie by smoothing back each section with Rosemary Repel Styling Gel. Braid each section and secure with hair tie when styling is complete. Step 3: Make It Stay – Once braided to perfection, secure loose strands by spraying the scalp and back of the neck with Rosemary Repel Hair Spray before topping it off with a beanie. This all natural formula is lightweight and works to keep the lice away. Make sure there will be no critters returning home with them at the end of the day – teach them the importance of not swapping hats and other accessories with their friends. Step 4: Static Control – Time to peel that beanie off your young one and see what surprises are waiting for you under there! Remove hair ties and unravel the braids. Tackle the static and fight the scent of sweaty hair by spraying Rosemary Repel Conditioning Spray throughout hair and scalp. Begin combing through with a wide tooth comb, applying additional conditioning spray as necessary. Aloe, Vitamin B and Amaranth protein work to soften, detangle and leave hair with a fresh scent kids and mom's love too.